328 pages | 49 B/W Illus. In a short time span, social media has transformed communication, as well as the way consumers buy, live and utilize products and services. Understanding the perspectives of both consumers and marketers can help organizations to design, develop and implement better social media marketing strategies. However, academic research on social media marketing has not kept pace with the practical applications and this has led to a critical void in social media literature. This new text expertly bridges that void. Contemporary Issues in Social Media provides the most cutting edge findings in social media marketing, through original chapters from a range of the world’s leading specialists in the area. The book is ideal for students of social media marketing, social media marketing professionals, researchers and academicians who are interested in knowing more about social media marketing. The book will also become a reference resource for those organizations which want to use social media marketing for their brands. Chapter 1 Citizen relationship management by the Government of India through social media channels. Chapter 2 Academia goes social media, MOOC, SPOC, SMOC, and SSOC: The digital transformation of higher education institutions and universities. Chapter 3 Integrating community and relationship building into universities’ social media marketing: Implications from a case study. Chapter 4 Social media marketing for B2B: From information to decision to retention. Chapter 5 Social media stakeholder co-creation of celebrities as human brands. Chapter 6 Social recruitment: Investing in social currency. Chapter 9 Social media engagement and return on engagement. Chapter 10 The consumer engagement/return on social media engagement interface: Development of a conceptual model. Chapter 11 An unexpected journey: The influence of social media on consumer decision-making. Chapter 12 Network based choice formation: A review in the context of online communities. Chapter 13 Creepy and intrusive: A consumers’ perspective of online personalized advertisements. Chapter 14 Social media measurement and monitoring. Chapter 15 Attitude towards brands and advertisements: Qualitative and thematic analysis of social media data. Chapter 16 Strategizing social media presence. 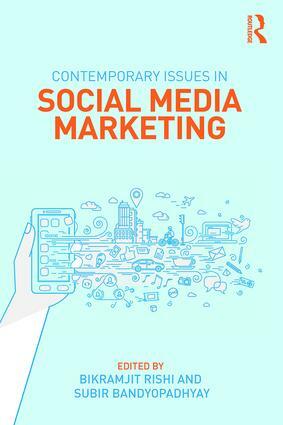 Chapter 17 Salient role and centrality of trust in social media marketing. Chapter 18 Trust relationships in social networks: A typology of strategies for communication between companies and their consumers. Chapter 19 Like-influencer framework: A study of factors influencing click of `Like’ option by users on Facebook. Chapter 20 Mechanisms for incentivizing and encouraging online social interactions - an experiment analysing the role of recommendations and rewards on advertisement sharing behaviour. Chapter 22 Profiling youth on the basis of their motivations for social media political participation: Implications for political marketers. Chapter 23 Privacy and information trading on social media applications. Bikramjit Rishi is Associate Professor of Marketing at the Institute of Management Technology, Ghaziabad, India. Subir Bandyopadhyay is Professor of Marketing at the School of Business & Economics, Indiana University Northwest, USA.